This gentle daily use shampoo harnesses the power of plants to moisturise, soften and cleanse your unruly hair, minimising frizz, flyways, kinks and waves. Aveda Smooth Infusion Shampoo protects the surface of heat styled hair for ultra shiny locks. While excessive heat styling and external aggressors can cause even the sleekest style to frizz up, this extremely lightweight formula from Aveda protects your hair to significantly reduce frizz and unwelcome kinks or waves. The exclusive plant extracts in Aveda’s Smooth Infusion Shampoo contain a blend of organic aloe vera, maize and guar bean to create a smooth new surface on your hair resulting in gorgeous silky, shiny tresses. Save 25% per ml based on RRP. *1000ml price is 3 times the price of 250ml container. Massage Smooth Infusion Shampoo into your wet hair and scalp. For best results, follow with Smooth Infusion Conditioner. My daughters and I have used Aveda hair products for years , all three of us champion healthy, bouncy non-frizzy hair as a result of this product. The 1000ml size is just perfect to sit in the corner of the shower cubicle and so easily dispenses with the pump. Perfect ! Slightly more expensive than high street brands but a little goes a long way and we always replace our stock when it is on offer ; highly recommendable. A famous professional brand and sold in good price, just have a try. 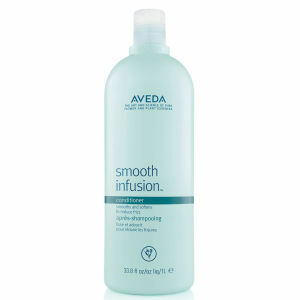 This Aveda Smooth Infusion Shampoo is a nice product that smells good! Undoubtedly the greatest shampoo I have ever tried - and I have tried heeps! The greater difference is, that the Smooth Infusion Shampoo is actually worthwhile. You have got try it. This is the best shampoo i've ever used as it perfectly fits me. It leaves my hair smooth, does what it says and make my hair super clean! :) I love it and buy it again and again. Great for fizzy long straight hair! This is just the best, I've ever had, my advice to all the women with the problematic hair. You have to try Aveda Smooth Infusion Shampoo. I have natural curly and frizzy hair and this series (shampoo and conditioner) really works well on my hair. Hair look smooth and becomes more manageable after using it.